Among the digital literacy resources Public Library Association (PLA) promotes is Digital Learn. 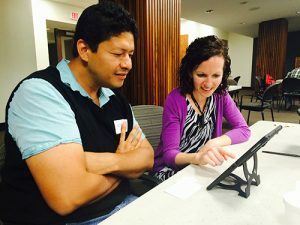 The site offers tools for self-guided learning, a network of individuals sharing ideas, best practices, and resources around digital literacy, and a searchable database of free computer training. ALA Washington Office’s District Dispatch also has a collection of blog posts related to government policy and initiatives geared towards digital literacy at Digital Dispatch. Libraries promote literacy and learning across the lifespan through providing access to materials geared to help people from all walks of life. Through the implementation of effective collection development policies, as well as classification and cataloging of library materials in accordance with descriptive standards such as Resource Description and Access, technical services and materials selection professionals ensure that patrons have access to quality resources that are relevant to their literacy needs. Since 1957, the Association for Library Collections & Technical Services (ALCTS) and its members have served as leaders in the areas of materials acquisition, identification, cataloging, classification, and preservation. Through its Online Learning, ALCTS hosts a series of webinars and web courses that include digital literacy, such as on podcasts and the role that librarians can play. See the division’s YouTube channel for the complete archive of free webinars. © Copyright 2019 Welcome to ALA's Literacy Clearinghouse. Rara Academic by Rara Theme. Powered by WordPress.